Posted by Chris on Tuesday, January 30th, 2007, at 7:56 am, and filed under Knitting. I’m so articiulate this morning. Chris- I didn’t mean to suggest that you would be so crass as to show Chaos on the potty! My cat must be so deprived- he has no cardboard scratcher. Instead, he uses my sofa and chair in the living room. He’s down to the frame in some spots. I think that is the correct term, 70s kitchen. I always hate ripping out a sweater. Better than letting good yarn go to waste. Nice STR yarn! 24- what can I say but the best show on TV. Aww, poor Door County cable! Interesting design but I would be too afraid to wear it in case those dropped stitches get caught on something. Not the 70’s kitchen, May! You need your eye sight checked. Just the purple yarn! It’s black, it’s a raglan and it’s made of Brown Sheep – love it!! That sweater is going to look nice once it’s all finished and knit up. And that sock is VERY 70’s! I admire your knitting of the black. You are obviously younger than I am and can see it! My first house had a north facing kitchen,and I inherited spice brown painted cabinets and burnt orange walls ( very dark we needed lights on in there all the time). Having redecorated that 70’s nightmare my next house came with mushroom brown cabinets and 70’s floral brown cream and orange wallpaper! Wow that sock color really does rock. Makes me want to paint all my molding brown. Love the color of the socks. I think the Refined Raglan is going to look great. Now you can knit yourself another cat! The kitten isn’t much kitten anymore. Getting harder to tell her pictures from Chaos’. LOL! That is so 70’s kitchen coloured yarn! The Refined Raglan is an excellent choice – and very elegant in black. I’ve been eyeing that same sweater from Interweave Knits! I’ll be interested to see how you like yours. Chaos is taking no chances; he’s staying way up away from the knitting just in case it turns into a bib. I love the 70s kitchen socks. They’re very…seventies. And now that I’ve seen them I want to go baste a turkey. I love the socks too! 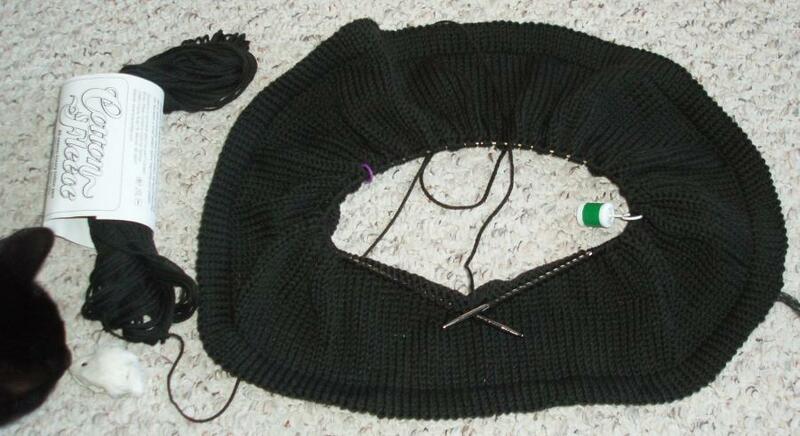 I can’t wait for your finished sweater. I really like that pattern! I think the refined raglan is such a pretty pattern; it will look great. Those socks are 70s kitchen. Much better in a sock than an actual kitchen! What is it with cats liking to chew yarn? 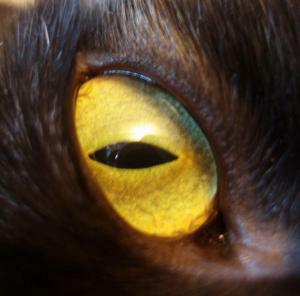 My parent’s cat tried to eat mine over the holidays. It doesn’t look or smell like kitty treats or tuna. I find their fascination a mystery. Chaos is such a handsome fellow! What an actual sweater? REally? are you sure you just didn’t pose the cats to look like a black sweater laying on the floor. Basil says he could teach the cats a thing or two about biting through yarn, he can snap a piece of yarn in a second. Literally. I LOVE the colors in the sock! That’s a great name for that colourway! 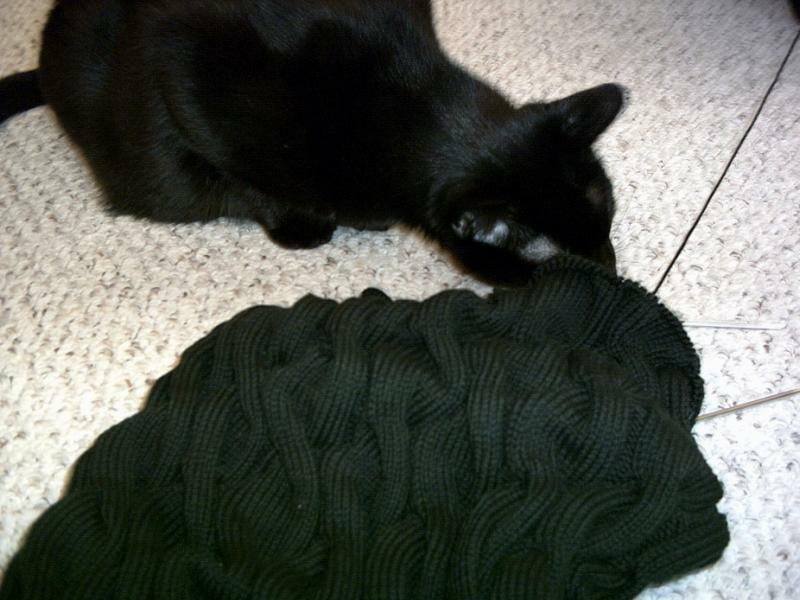 And it’s good to see your knitting being so competently supervised. Ha! Yes, I’ve been in some kitchens with that colour scheme. Perfect! That was a lot of sweater to frog! I’m all for tearing it out if it isn’t going anywhere, though. It’s such a relief. Have to admit I did a double-take on the shot with Chaos’ cardboard scratcher yesterday, but since my kitties don’t have claws, you don’t see those around here – however, my Big Sis had a House Panther and HE had one! That’ll be a very nice sweater! And, while I’m not fond of the orange-green combo, that STR Rare Gem actually looks better than I imagined it would. Good for you for frogging. And I really like that sweater, it’s on my overlong “I want to make it” list! I did raise an eyebrow at Chaos, but I knew you wouldn’t put up a pic w/ him doing his thing so publicly! LOL at the “70s kitchen” colorway! Looks like May has been busy. I am surprised that Chaos got that close to the sock if there was any suspision to it being a bib! I think that should’ve been the “Don’t Mind Me” post!! 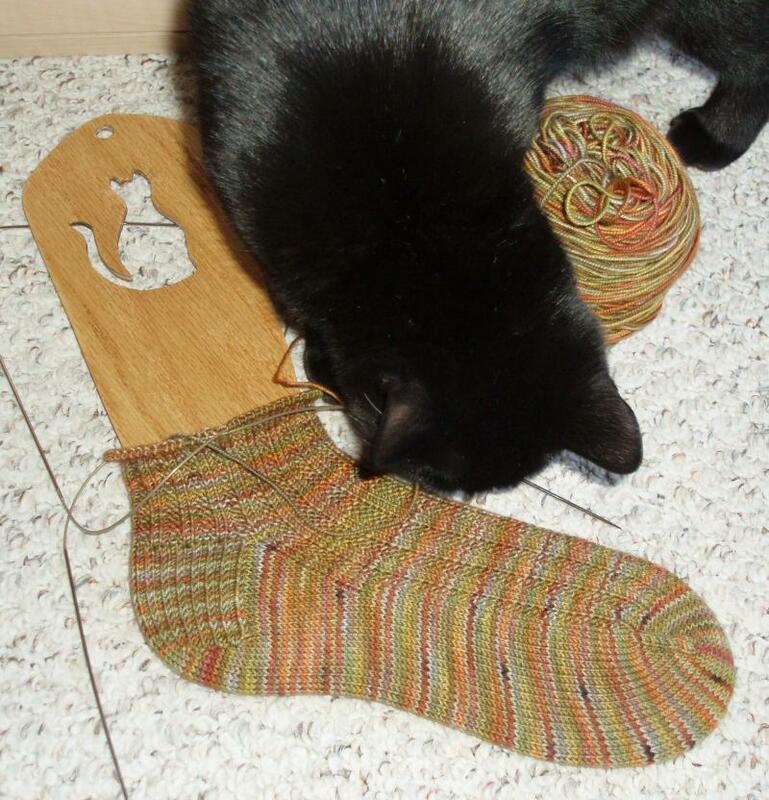 Beautiful socks coming along there ;o) I noticed it was a cat scratcher! A black sweater may not be good blog-fodder, but it will be a great wardrobe staple, I’m sure! I like the refined raglan better than the Door County Cable sweater. The cables looked great, but kinda busy. I really like the refined raglan. I really like the refined raglan, and even though it’s hard to photograph and blog about, I bet a black sweater will get worn tons.